There are several options for extended stays, but most require sacrificing at least one thing you need to enjoy a temporary housing situation. Dwelling Suites is your best option for short-term housing, based on Comfort, Convenience and Cost. 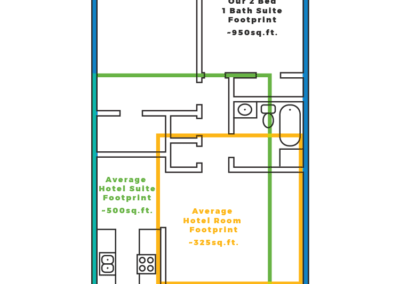 The average hotel room is 325 square feet. 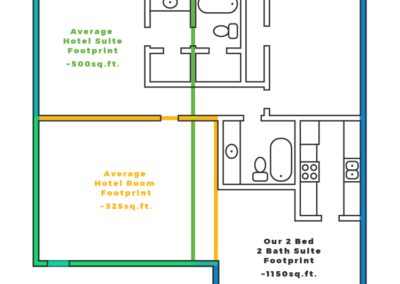 Most hotel “suites” are around 500 square feet. Our two bedroom, two bath suite is 1,150 square feet, more than triple the size of a hotel room, with a truly full-sized kitchen, dining room, and a real living room, all furnished for comfort and stocked with everything you need. While most hotels have the essentials, their limited space, nearly non-existent privacy, and generally spartan accommodations can get old really quickly. Every Dwelling Suite has spacious, quiet rooms with ample privacy and furnishings. 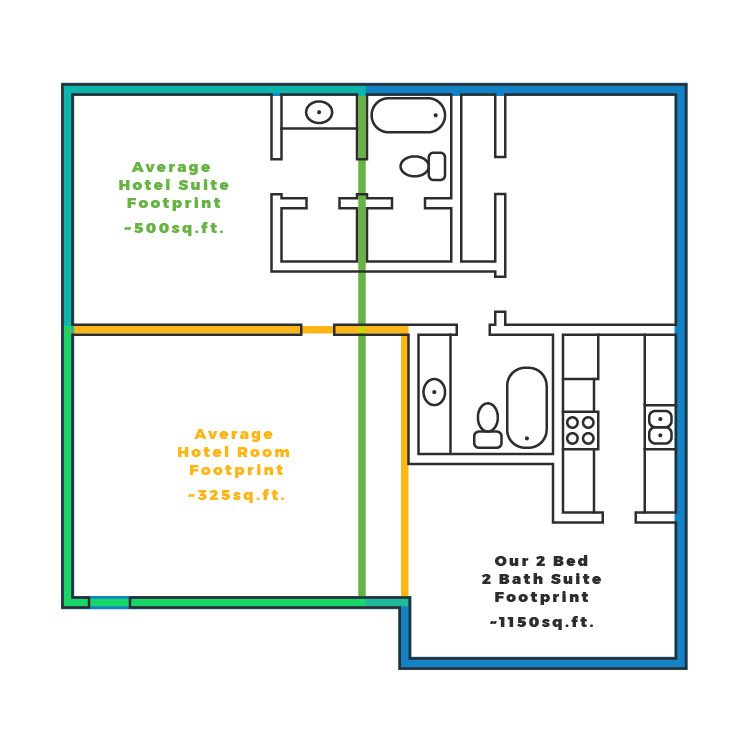 At an average area of only 325 square feet, it will be challenging to enjoy your free time during an extended stay at a hotel. 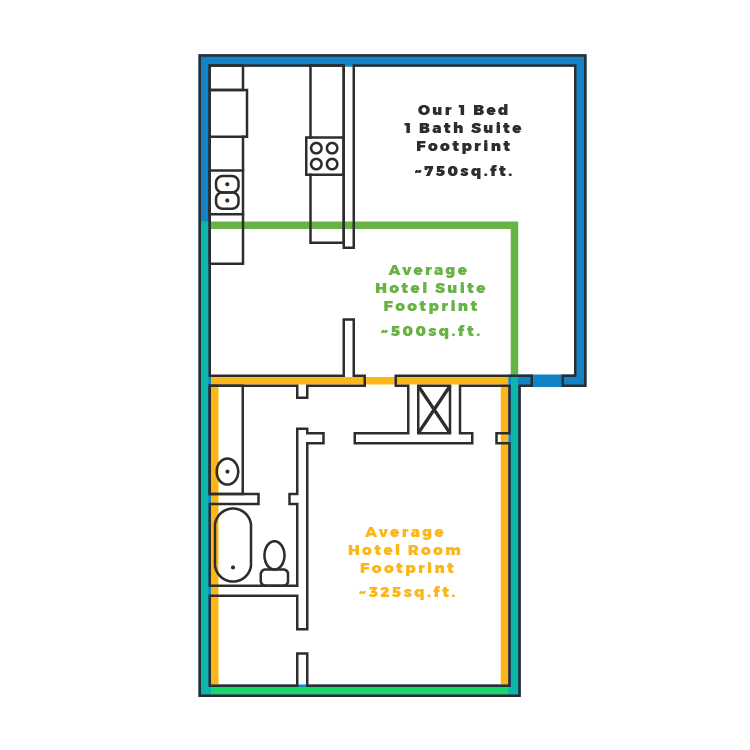 When 15% of your room is bed, 15% is devoted to a bathroom, and another 30% allocated to circulation, your “living space” is usually the equivalent of a large hallway with a small couch or desk crammed in the corner. Switch to corporate housing for breathing room. Most hotels have paper-thin walls and no insulation between levels, ensuring that you can hear everything your neighbors do. Whether they’re checking in at 2 am, have kids who like to get up at 6 am and run around over your head, or simply don’t realize how loud their television is, hotel rooms often leave you feeling stressed. Corporate housing eliminates most of these factors, providing a comparatively tranquil setting for you to live in. Many people find housekeeping services invade their feeling of security and privacy. You don’t always have time to pick up your dirty laundry and stow valuables before you race out the door for work, and it’s nice to know that no one will disturb your space until you invite them in if you’re staying at a corporate suite without housekeeping. Of course, you can usually put up the “Do Not Disturb” sign at a hotel, but then you’re paying for a service you’re not using. Most hotels, especially affordable ones, buy furniture designed to last and fit in small spaces. Consequently, you often don’t have anywhere to truly relax when you stay at a hotel. Often, the mattress is also a problem, potentially causing long-term fatigue and exhaustion over the course of your extended stay, which will make whatever you’re in town to do much more challenging. By choosing corporate housing instead, you’ll be able to enjoy your downtime as you sink into a plush, oversized couch and sleep on a truly comfortable mattress. 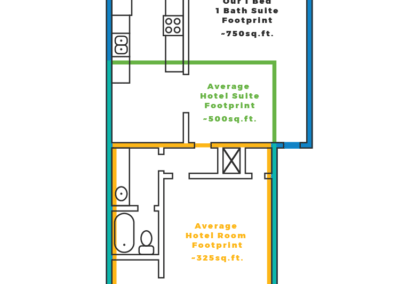 Even our smallest suites are 750 square feet, more than twice the size of the average hotel room. All our corporate suites include a real kitchen, full-size living room and dedicated dining area. Our larger extended stay suites even have office nooks! 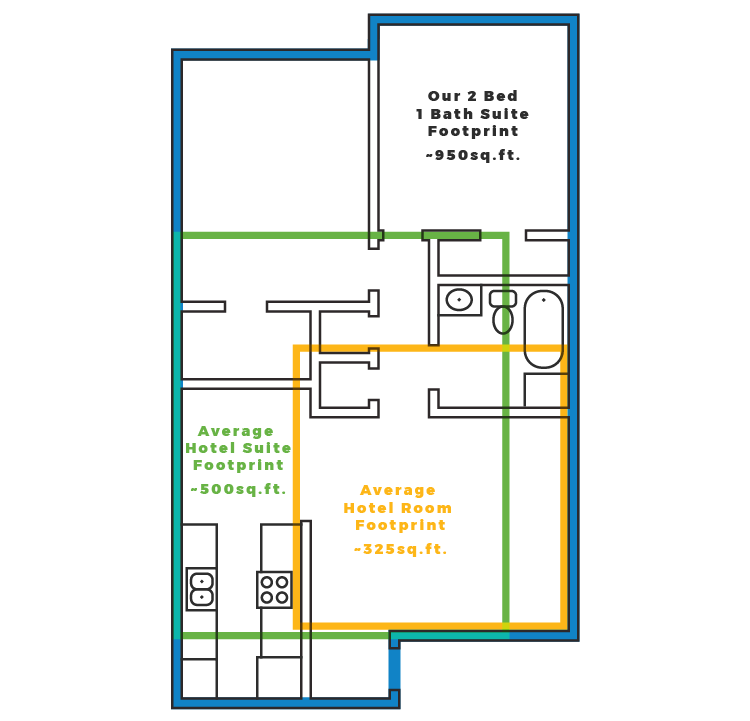 Most corporate housing suites are part of normal apartment complexes or condos with good insulation. This means you will be able to enjoy a quiet, relaxing stay and have fewer issues with noisy neighbors than you would in a hotel. Corporate housing suites are often unserviced, meaning that you will have total privacy. No one will come in or bother you in any way. You’ll be free to keep your temporary home however you like it. Corporate housing is probably best known for its luxurious furnishings. With all the extra space a corporate suite has, you can expect a full living room with comfy, inviting furniture that makes you feel at home. Most corporate housing providers do not keep utilities and furnishings ready to go in unoccupied suites, because it’s too costly to do so. This causes most corporate housing to be available with a 3- to 7-day lead time while everything is moved in and set up. Consequently, if you have an immediate need for temporary housing, you’ll have to wait in a hotel, bleeding money until the extended stay corporate suite is ready. Dwelling Suites, however, is able to keep its suites available for occupation within 24 hours,* if necessary—we even have an automated booking system which allows you to reserve your suite without waiting for a person to get back to you during normal business hours. *Subject to availability, approval and certain circumstantial restrictions. Through our Guest Portal, Dwelling Suites enables you to manage your reservation and payment methods, view your rental agreement and statements, and submit maintenance requests. We provide you with all the tools to do things on your schedule, including a step-by-step walkthrough for check-in and check-out, instructions for how to use your phone to watch things on the television, where to find everything in your new home, and a guide to tourism in San Antonio. Using our Guest Portal, you have everything at your fingertips. Corporate housing has many benefits over the average hotel and extended stay hotels, but fewer affordable providers. Dwelling Suites offers a unique combination of benefits in San Antonio, providing a faster turnaround and more value than other Corporate Housing Providers in San Antonio. We are the most affordable extended stay option that doesn’t sacrifice your comfort. Most hotels have paper-thin walls and no insulation between levels, ensuring that you can hear everything your neighbors do. Whether they’re checking in at 2 am, have kids who like to get up at 6 am and run around over your head, or simply don’t realize how loud their television is, hotel rooms often leave you feeling stressed. If you use corporate housing instead, you’ll find a refreshing level of peace and quiet. Corporate housing has many benefits over the average hotel and extended stay hotels, but tend has fewer affordable providers. Dwelling Suites has a faster turnaround and more value than the average Corporate Housing Provider. We are the most affordable extended stay option that doesn’t sacrifice your comfort.